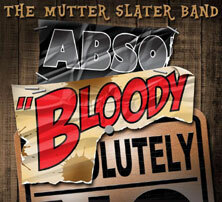 mwe3: The new Mutter Slater Band album is called Absobloodylutely. How did you come up with that title? (lol) Is it one of your favorite sayings? Mutter Slater: We recorded the track with that name and a couple of band members said that it would make a good album title so I went along with that in the absence of a better idea. Absobloodylutely as a song came about after I had gotten exasperated with the over use of absolutely as a synonym for yes or certainly. It really got to me  If I hear abso  bloody  lutely again Ill go nuts... that sort of thing. The song itself deals with the shallow commercialization and feeble celebrity of modern multichannel programs. mwe3: Tell us about your band, the Mutter Slater Band. When did you form it and how long have you been working with the MSB? I was amazed at how good the band sounds, as I had never heard you as a solo artist. You released another CD before called Riding A Hurricane too right? Have you worked with other bands besides Stackridge over the years? Mutter Slater: Ive only really done my own thing outside of Stackridge so MSB is my only project these days. The band was only a three piece at the time of Riding A Hurricane, unfortunately the other two musicians were busy with other outfits and couldnt commit to MSB. I decided to try again after a short break. The other members are all local to me here in South West Dorset and were all people I had heard play around the area who I rated. I had no preconception as to the final lineup, it grew organically. I did stop at six though; I had no desire to run a big band. Weve only been together a year or two, but I agree that it sounds nice and tight. That is down to the musical experience, pedigree if you like, of the individual members. mwe3: How does Absobloodylutely reflect your interest in American blues, soul and R&B and how does Absobloodylutely compare to your other album, Riding A Hurricane, sound wise and compositionally? 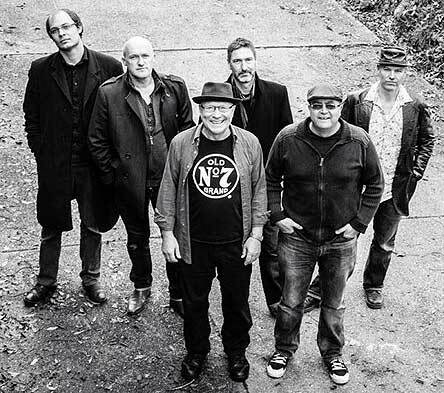 How different was it working with Chris Cleaver as a producer, compared with Billy Bragg, who worked with you on Riding A Hurricane? 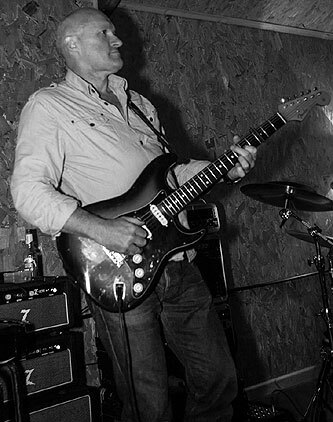 Chris Cleaver, who in addition to engineering and co-producing the Absobloodylutely album, also played all the guitars. Theres some amazing guitar and sax work on Absobloodylutely too. Where did you find a major guitar talent like Chris? The MSB band sounds totally amazing! Mutter Slater: I think that anything I write these days will be heavily influenced by my fondness for American R&B, blues and soul. It carries so much emotion as well as being able to bear the weight of a decent tune. Billy and Chris are completely different to work with. Billy tended to let me have my head and only really come up with a suggestion when he thought it was necessary. Chris, on the other hand, rolls up his sleeves and really gets stuck in. He was a key factor in the way the band sounds, both in the studio and on stage. He is such a distinctive guitarist and always brings something fresh and unexpected to a song. 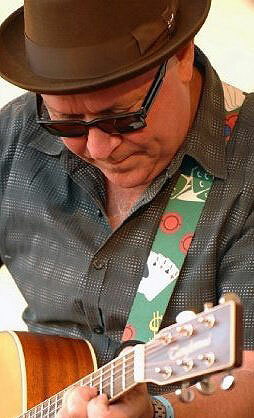 I first saw and heard Chris playing in a local blues band and was impressed from the word go. As you so rightly say Clive Ashley our saxophone player is a mean player too. Ive been playing with him for years now, once you find someone that good you hang on to them! Im glad you like the band: I couldnt be happier with the result myself. mwe3: I remember how great A Victory For Common Sense sounded in 2011 and then I just recently found out you left Stackridge! I cant imagine a better Stackridge album, seems to me like A Victory For Common Sense is kind of like Mr. Mick in that, with you and Crun leaving the band, its kind of a 21st century swan song now. So now Stackridge is only Andy and James left? What of Crun? Mutter Slater: Yes I think A Victory For Common Sense was our best ever album. Chris Hughes the producer managed to make it sound both coherent and cohesive. The song writing is not as patchy as our previous offerings either. It was a nice way to draw a line under my Stackridge career. Yes, Crun left shortly after I had done the same. He had moved to Hereford which is some distance from Bath where the band is essentially based and found the logistics a bit of a problem. Ive no idea if he is doing anything musical these days. Andy and James are still working together though, either as Stackridge or The Korgis. mwe3: So how do you compare Absobloodylutely with your sound in Stackridge? Absobloodylutely is a lot heavier right? Were any of the Absobloodylutely tracks played with Stackridge or are they all new? Mutter Slater: I dont know if its possible to compare the two really. Absobloodylutely is probably more consistently American in its influences than anything Stackridge would do. No, nothing here was played by Stackridge. 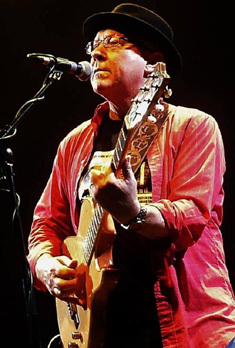 I did play a couple of the songs to Andy Davis on an acoustic guitar before a gig, but he didnt rate them, so I took the hint and did them myself. mwe3: The lead off track on Absobloodylutely is Were In The Money which you commented was about some guy going off his head after he wins the lottery. Is there a social statement in the song about that kind of unimaginable excess? People stampeding for money is the other extreme. Sad to say but, music to stampede to? Im thinking of that crazy new years eve cash stampede in China! Mutter Slater: There was some oaf who won 9 million on the lottery and basically made a spectacle of himself by going nuts with the stuff. Hes all right now though  hes lost the lot. I dont know about a social statement. The song is written in the first person, so the singer is basically dropping himself in it by listing all the pointless things hes doing with the money. The opening lines were inspired by the story of Keith Moon driving a car into a swimming pool. Ive no idea if it was actually true or not, but its a good story nonetheless. Weve had retail lunacy over here too. People fighting on a store floor for a flat screen TV  blinking mad! mwe3: Track 2 is The Price follows Were In The Money. I dont think Ive ever heard that sort of powerful kind of track from you. Is that the most powerful, sound and lyric, track on the Absobloodylutely CD? Another very un-Stackridge kind of track. Mutter Slater: I wrote The Price years ago when I was going through a really rough time with my ex-wife so it really was written from the heart. It does seem to connect with people who have had similar experiences though. mwe3: Bridport kind of gets back to that upbeat Stackridge kind of sound. Tell us about Bridport and is it a real place? Can you tell us something about where you grew up and what your childhood was like? Mutter Slater: I live in a place called Bridport. I wanted to do a place name type of song but try and use an English location instead of American. You have such great city and state names that lend themselves to use in song in the USA, were not so lucky in the UK. Going to school always involved a long walk for short legs. We eventually settled in a village in Somerset when I was 7 years old. That was the first place Id lived where there were neighbors. I must say that I enjoyed the free range life style. It was idyllic. mwe3: The Old Dog is really creepy and sounds like Creedence Clearwater Revival or even Led Zep. 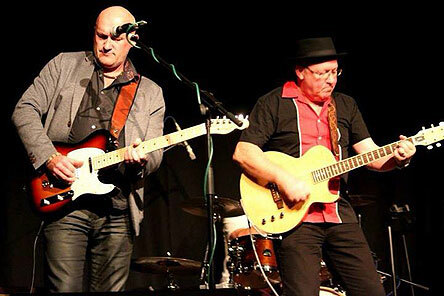 Is that Chris Cleaver on slide guitar? Great sound. Is that as heavy as you get as a solo artist? Mutter Slater: Yes Chris on slide. Nice and dirty. Its interesting that you should mention Creedence and Led Zep. I hadnt thought of them. The lyrics were intentionally vague yet dark, like Edgar Allan Poe. Ive got a new song for the next album which is just as heavy and dark, if not more so. mwe3: The title track Absobloodylutely is also pretty harrowing. You sing so calmly yet the subject matter is like the twilight zone. You mention its about pulp television. Mutter Slater: It astonishes me that we have so many TV channels these days and yet so few decent programs. I think that were turning peoples brains to mush with these channel fillers. Thats what Absobloodylutely tries to deal with. And a sleeper through his eye. But he is such a lovely build. She used to be with what's his name. And their rooms are such a mess. And the dog bowl full of fags. mwe3: Think Of Me Once is pretty classic sounding. A million dollar song that should be top ten. Its kind of oozing with a heartbreaking kind of sentiment and then your flute solo kind of seals the deal. 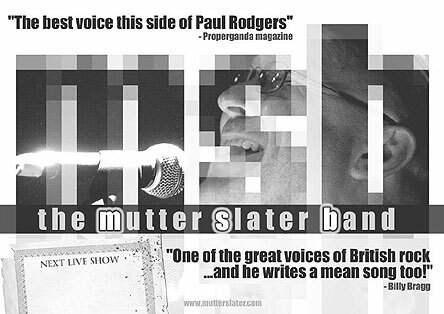 Mutter Slater: Mick Howe, an old musical mate of mine, had the chorus and its words and hence the sentiment. I tried to write verses that echoed it. It has that old blues sort of pay off  if you dont want me Im out the door and moving on. mwe3: The Boy has a story but I cant make out the lyrics. Another country type track. I couldnt understand what you said about it being about the arrival of a shamanistic toddler... (lol) Its kind of a funny song right? What are the key lyrics to The Boy? Mutter Slater: It was inspired by a program about Rasputin, believe it or not. His childhood was spent in a remote Siberian village where superstition and pagan beliefs maintained equilibrium. They still go to the shaman rather than a doctor if theyre ill today. I thought it would be fun to have a toddler suddenly appear in such a community and let the subsequent fear and superstition gnaw at its core. Its a light hearted romp really. Came a small boy. No one knew where he belonged. The boy had power, could drive a turbine with those thoughts. And in the springtime came the fever and the fits. mwe3: Cindy Lou is another MSB classic. It should have been a hit with Stackridge! Its lyrically complex but I cant tell if the lyrics are serious or a put on. (lol) I pray to you for guidance but your answer is obscure... (lol) ZZ Top meets Stackridge. Whats the inside story on Cindy Lou? The rise of feminism? You set your eyes on someone, then you load your magazine... A cry out to return to the way love used to be? mwe3: The Unforgiving Man closes the CD and is another highlight of the Absobloodylutely CD. Its certainly the most cryptic track on the album. The unforgiving man is the one causing all the trouble in the world? Are we all guilty? Is there a message to man about how we can settle the score once and for all or is that armageddon? Mutter Slater: Every songwriter has to have at least one song featuring the devil. This is the one for this album. The human addiction for making war regardless of human and financial costs never seems to leave us. I thought Id write about it from the devils viewpoint: rubbing his claws with relish as the unforgiving man gives him further opportunities to wreak havoc and perpetuate misery and suffering. No message other than I can see no improvement on the horizon  business as usual for the devil and his buddies. To the memory of the unforgiving man'. In greasing the cogs of our machine. That satisfies the unforgiving man. We can't deny the unforgiving man'. But he came and brightened up our fall from grace. Vengeance is mine, said The Lord? He really ought to hear himself one day'. The devil said, 'Hey buddies, the unforgiving man? We'll never see the likes of him again'. mwe3: Whats been the reaction to Absobloodylutely among Stackridge fans and has anyone from the band, Andy, James or Crun given you any feedback on Absobloodylutely? 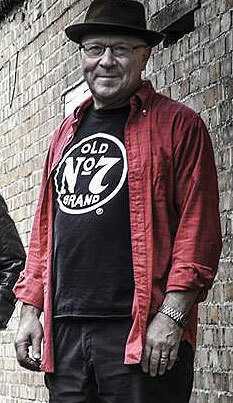 Mutter Slater: Mike Tobin, Stackridges manager, likes it. 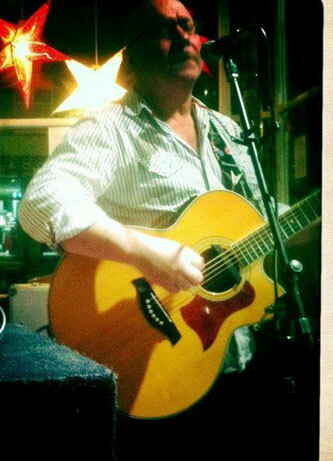 I dont know if anyone in the band has heard it, although Andy has come to a couple of gigs and has enjoyed those. A compliment from Andy is very rare currency. mwe3: In addition to your song writing and vocals you were also the flutist in Stackridge as well and you also played the mellotron in the band too. Do you also play guitar as Ive seen you playing guitar in some pictures and do you still play the tron? What instrument do you mostly write music on? Is every song written differently or do you have a set song writing style? Mutter Slater: Yes I play guitar and flute in the band. I havent played any keyboards for years so all song writing is done on the guitar too. All writing begins with the music for me. It may be a certain chord sequence that grabs my attention, a riff or a melody. Once I get hooked I keep playing the bit I like and let that inspire the next section of the song. I try to find an interesting path  nothing too predictable. This also applies to the lyrics, which invariably come last. I need to discover a different angle or an intriguing line then Im off. Mutter Slater: Im just lucky I guess. I certainly dont sing any Crun songs  he doesnt sing any of mine! mwe3: Looking back one more time, the final Stackridge album (so far) A Victory For Common Sense was such a great album. Were you disappointed that the album wasnt a bigger hit? Is Chris Hughes still working at Helium Records? What a way to go out! Is there still hope for another Stackridge album in our lifetimes? Mutter Slater: There certainly wont be another Stackridge album with me on board, but Andy and James may have something in the pipeline. I really have no idea what Chris is up to these days. I hope he still has some projects on the go as he is such a supremely gifted producer. Releasing a CD is a lottery with the odds stacked heavily against success, so A Victory For Common Senses failure was unfortunate but no great surprise. mwe3: Looking back what do you think was the high point in Stackridge? Some albums you left, but for instance Mr. Mick and Extravaganza are still brilliant. 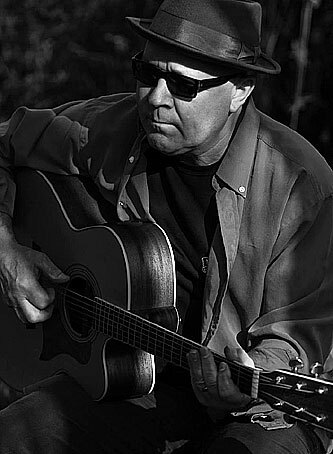 Do you have a favorite Stackridge album or does that opinion change every day? Mutter Slater: As I have said, I think A Victory For Common Sense was our most successful album artistically. The others each have their highlights and conjure up some fond and not so fond memories, but I dont dwell on the past as a rule. The present is perfectly OK with me. mwe3: Do you keep an eye on whats going on musically in the world these days or is it all over the top? I remember 1975! Can music still thrill you with anything new these days? Mutter Slater: No I dont keep abreast of contemporary music. Time is too short. I get my musical kicks from writing and playing, if I happen to hear anything I like on the radio or TV Ill pay attention. Its a rare event though. mwe3: Do you have any side projects or other interests outside of music that you can share with the readers? Mutter Slater: I work as a barman and doorman to help subsidize my music and I have my home life with my lovely wife Linda that really fills my days. mwe3: What plans do you have for 2015 as far as writing, recording, performances, collaborations? I hope therell be another album as good as Absobloodylutely from the Mutter Slater Band at some point in the future. Mutter Slater: We start recording the next album next week. Weve already gigged four of the new songs so theyre nice and tight. Once weve nailed those well start learning some more that wait in the wings. Im proud of what Im writing these days and weve learnt a lot from the process of recording Absobloodylutely so Im confident that well maintain the standard.